Living in Thailand, and traveling throughout Asia, you become quite familar with the ride known as the tuk tuk. You see them everywhere and tend to be the cheapest form of transporation, for the money. 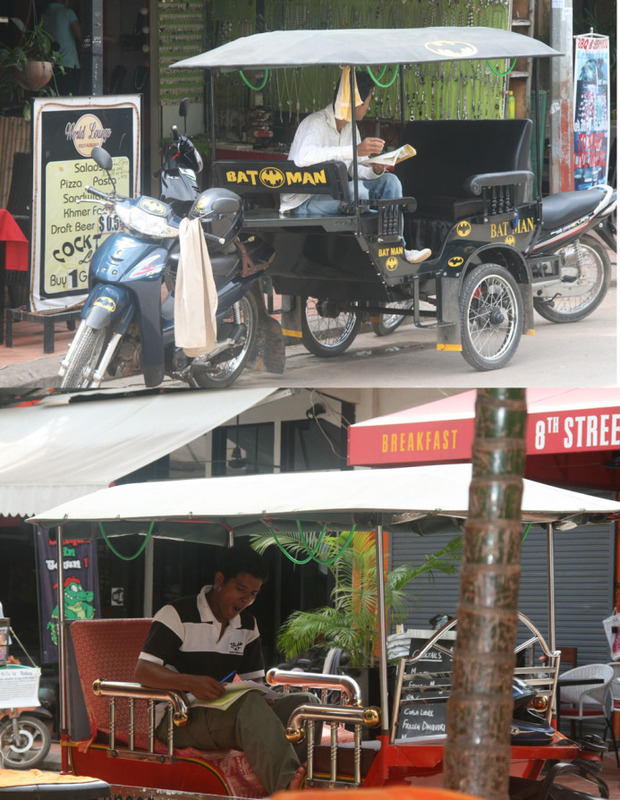 In Thailand, the tuk tuk is like a moving wagon in which three peole can fit in comfortably. It tends to run on a motor, al as one unit. Well in Cambodia, these drivers pimp out their tuk tuks like never before. First off, instead of it being one unit, they found a way to lodge the actual carriage part onto a full powered motorbike. Thus, creating the fastest and most agile tuk tuks I have ever seen. A few stood out to me. I couldn't help but love the cleverness of the bat mobile. Then you have the bed head board, shiny metal, relaxing version. There was even a "rock and roll" version driving around. This guy would allow you to plug in your mp3 player and play whatever music you wanted while being driven through..say, Angkor Wat. Dopeness. Thailand...it's time for you to start pimping your rides. tagged with love, weird, why?